This children’s book is best thought of as a modern-day Grimm’s fairytale. It has all the elements of Grimm stories, including the grim part!! So your young reader needs to have a strong inner spirit to read the book. But considering the amount of violence that current generations are exposed to, this children’s book is ultimately a light-weight in that department! 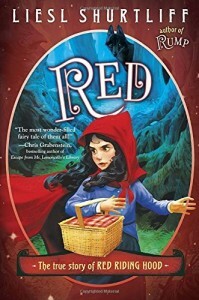 And more to the point, as with Grimm archetypes, we really encounter the shadow and glory of humanity in the pages of this book, without overdoing gory scenes. Rather, there are heart-wrenching decisions to be made, and difficult human facts to face. So while this children’s book is a fairy-tale, with some humor and adventure, it also is a serious adventure into life, growing up, and living in a world that is not always kind and fair. Most of all, it’s a story of honesty, courage, and friendship. Like her earlier book, Rump, the author offers us a coming of age book, this time for girls. What does it take to learn that all the power you need is within? And what more important message is there for any child to get, at any age. I do recommend the book, and though it is not all sweetness and light, because of the difficult situations the girls find themselves in, it is offered with a good motive. And it is a fairytale, after all. So we know it all ends well.